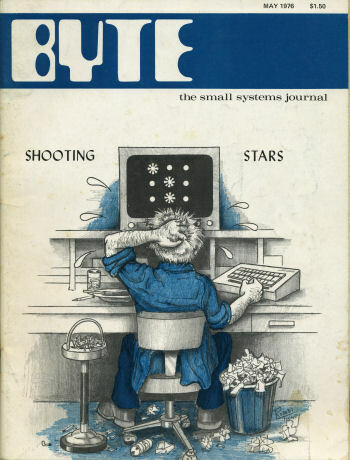 Byte May 1976 Front Cover - Featuring Shooting Stars by Wilard I Nico for the 8008 SCELBI 8H computer Download PDF. What's missing from computer magazines today are complete program listings with no strings attached. No ads, no copyrights, and no licence fees. In the early days of personal computing magazines like Byte and Dr Dobbs Journal contained programs for a software-hungry readers to toggle into their systems one byte at a time. 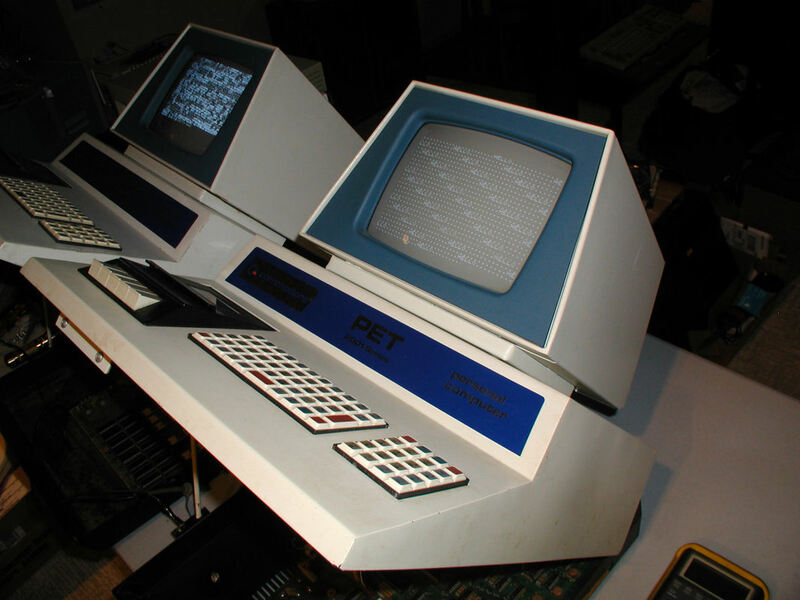 If you could manage to enter the octal or hex code into your SCELBI 8H, Altair, SWTPc 6800, Commodore PET, or TRS 80, the programs were yours to use as you saw fit. They also served as inspiration for new programs, sample solutions, and shortcuts. To follow is is a partial transcript of the May 1976 Byte cover story, followed by a few more similar articles. Interesting that Byte in May 1976 felt it apt to publish an article about an 8008 system rather than a 8080 or newer processor. ".. There are probably as many reasons to have a computer in the home as there are computers in homes. For whatever reason you have one though, it's only human nature to want to show it off to other people. Say you have a super program called "Investment Portfolio Analysis and Statistical Summary" (I PASS) up and running on your Scelbi 8H or whatever. It took months to write and debug the program and it involved several unique concepts of which you are justifiably proud. You can picture the furious activity going on inside the little heart of the computer and would dearly love to show off your skill to Mr and Mrs Nexdor and bask in their admiration. So you invite them over for cocktails. The program runs flawlessly and, as the results flash on the display screen, you step back slightly to receive your praise. Mr Nexdor looks at you with a blank expression and says, "But will it grind pepper?" That actually happened to me. One way around this problem is to save (PASS) for your own enjoyment and have a game program or two available to show off. Of course, for some people game programs are the primary interest in having a home computer. Whatever your games interest, I think you'll find SHOOTING STARS an interesting addition to your library. I started my quest for a "show-off" game about a year ago, searching everywhere for one that was just right. I learned a very interesting fact quickly: My computer doesn't speak BASIC, and to date many games have been written and published in that language. So I had to do it myself. The result is SHOOTING STARS, a game with enough challenge to intrigue, enough variables to make learning to win difficult (but not impossible), and a couple of goodies thrown in to involve the player with the computer. 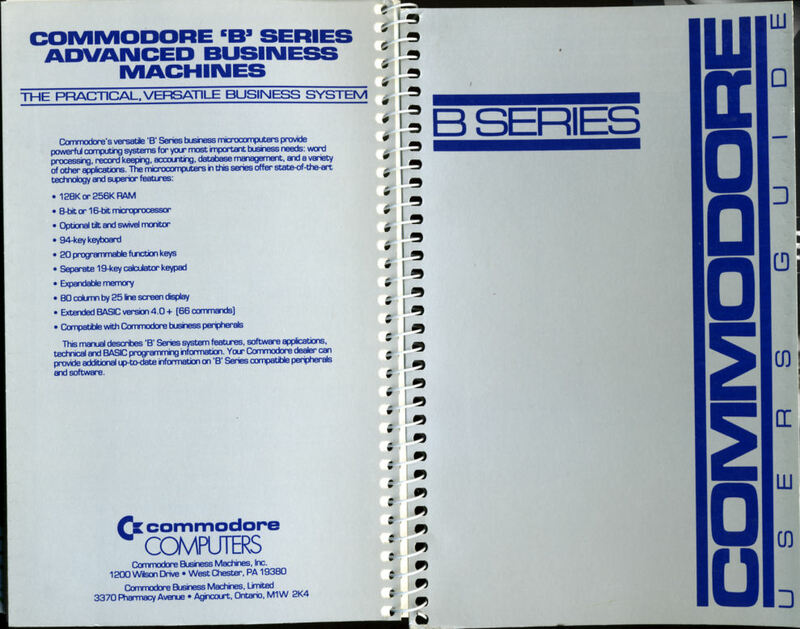 A complete program listing for 8008 computer is included, as well as the various messages that allow the computer to interact with the player. 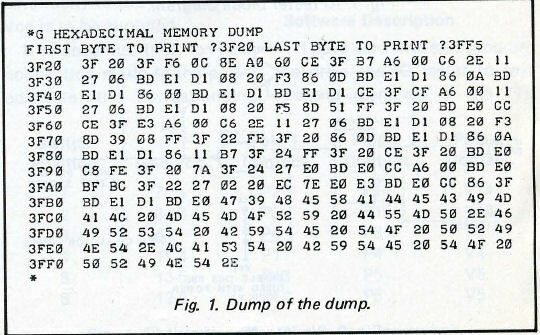 .."
Output from the Hexadecimal Memory Dump program. 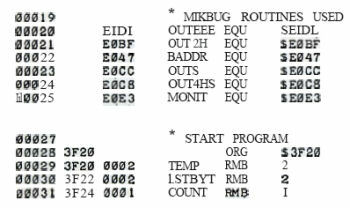 Because program listings often were provided in machine or assembly language, having a listing of the memory in HEX allowed a person to quickly check their work. It takes practice, but once you get used to thinking in HEX or Octal, it becomes second nature. Note that each row starts with a four-digit starting address followed by 16 two-digit alphanumeric operands (or data values). The first row starts at memory location 3F20, and the value in 3F20 is 3F. Reading left to right; the next 2-digit value, 20, is in memory location 3F21. The third value, 3F is in memory location 3F22. The fourth, F6, is in 3F23. The fifth, 0C, is in 3F24. The last value in the row, 11, is in memory location 3F2F. That's because F = 15 in HEX. 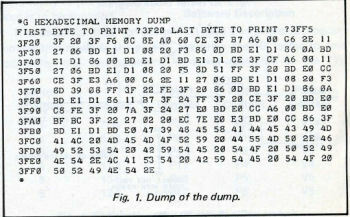 Each row in a HEX dump displays memory for location xxx0 ... xxxF. Click image for a larger view. 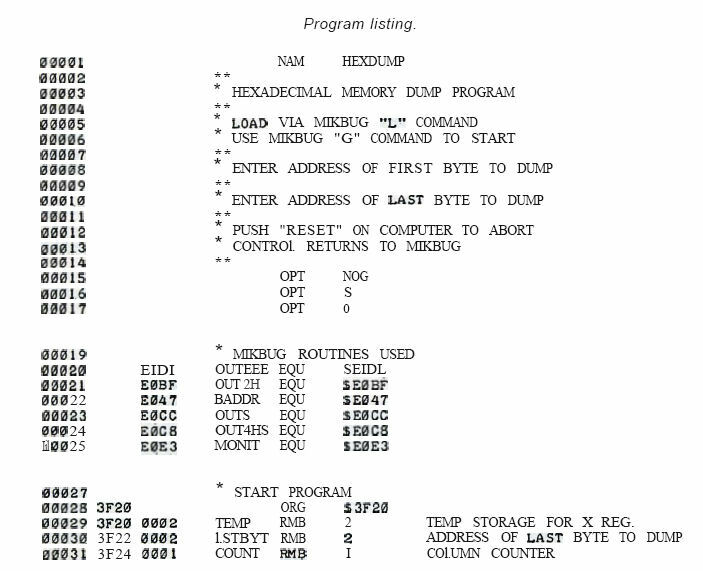 Code snippet of the Hex dump program listing included in the article. Line 00029 starts the program at memory location 3F20 and the next set of numbers in the row, 0002, refers to the value of the operands in memory location 3F20 and 3F21. The next line of the program 00030 displays what's in memory locations 3F22 and 3F23. Although the data does not match, the HEX dump above and the code snippet start from the same location in memory. Click image for a larger view. The first few lines of Minol ("mine all"), a version of BASIC written by a high school Junior named Erik T. Mueller published in the April 1976 Dr. Dobb's Journal of Computer Calisthenics and Orthodontia. Writing your own BASIC for the 8080 was a popular thing to do in 1976, and Dr Dobbs Journal was a popular magazine for budding software developers to get their programs listed. You may recall my earlier page about how members of the Homebrew Computer Club illegally distributed Bill Gate's BASIC, and the controversy between those who believed software should be free and those who believed (MicroSoft) that it should be licensed. Dr. Dobbs was formed in part as a response to Bill Gates Open letter to Hobbyists. Because most people had 4K systems back then, it was important to use as little space as possible. 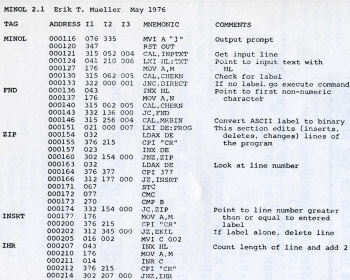 Here is a copy of Erik's popular Minol program - Note that it fits into less than 2K! - Download PDF. NOTE: I have included corrections to the original code, at the end of the document. Here's another program from Dr. Dobb's Journal of Computer Calisthenics and Orthodontia. 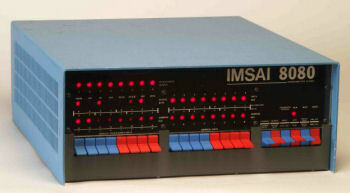 "..If you have a Processor Tech VDM any display that reads directly from memory, and at least 256 bytes of other memory, here is a random walk program you might like..."
For kicks I entered a modified for CUTTER version of this program into my IMSAI 8080 (pictured above) and made a You Tube Video. Send me your comments or questions regarding this program. 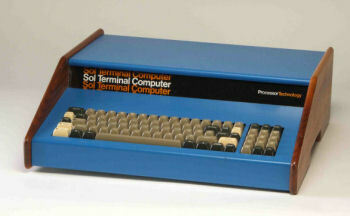 Even in the mid 1970's most computer users did not have the interest or patience to enter code into their systems using machine language. Even if they had the aptitude, the first thing many would do is create or load a version of BASIC for their system so that they could write programs more easily. 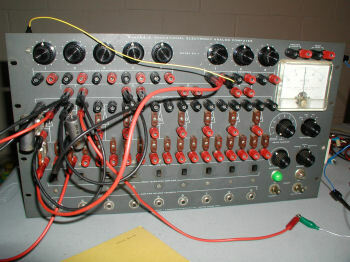 BASIC was invented in Dartmouth college by John Kemeny and Ton Kurtz around 1964. BASIC was designed to make it easy for people to interact with their computer by accepting instructions in regular English. Commands used in BASIC such as SAVE, IF THEN, and GOTO are easy to understand expressions. BASIC also supplied functions that allowed a person to manipulate data, perform math operations, and parse strings. 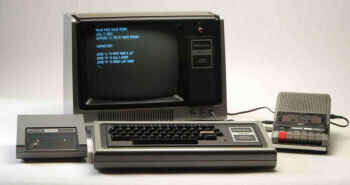 In parallel with the development of the microcomputer, BASIC quickly became the most popular programming language, and stayed prominent well until the late 1980's. 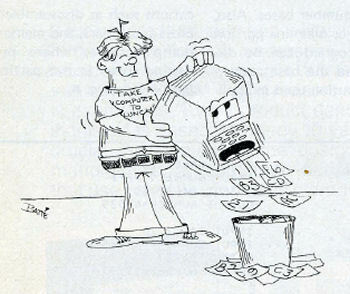 Computer magazines including Personal Computing began publishing free program listings in BASIC for their readers to type in a save on their systems. Eliza was an experimental psychoanalysis program written in LISP by Joseph Weizenbaum. Creative Computing in its Jul-Aug edition published a MITS BASIC version of Eliza, authored by Jeff Schrager. This is a good example of the types of programs that were popular with the new appliance computer user. Code sample from the Altair BASIC version of Eliza by Jeff Schrager as it appeared in the Jul-Aug 1977 Creative Computing magazine. Complete BASIC program listings were very popular and were still distributed freely in 1977 (with purchase of the magazine). Note how a BASIC program listing is easy to read and understand. Each line of code starts with a "line number" followed by BASIC instructions. 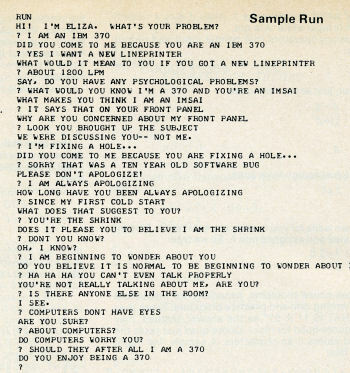 A "sample run" from the program Eliza on the MITS Altair 8080b computer. Please check here first with special requests for Commodore, IBM, Tandy, Atari, TI, Apple computers, parts, components, and software. I have systems plus zounds of miscellaneous items for sale or trade. Apple II with Apple disk drives and Sony Trinitron color television. Note Biorhythm program running on display. Click thumbnail for larger image. I signed up for the 2009 RetroChallenge Winter Warmup. 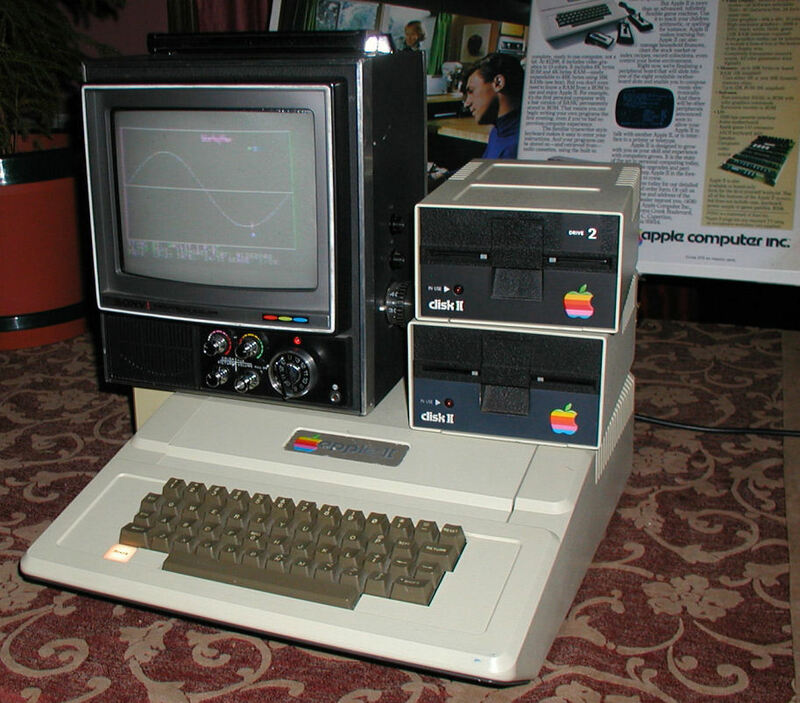 My entry was a Y2K-compliant Biorhythm program I wrote for the original Apple II computer, using a vintage color TV. Selected recent blog articles with extra content...See my Vintage Computer Blog to search for older articles, or post your questions. Evan gave me a GRiD GRiDPAD 1910 laptop without a power supply. Using another GRiD power supply that feeds 17.25V I was able to boot this system. The GRiD GRiDPAD 1910 touch-screen laptop. The touchpad has some bad spots, but I was able to look around. There are three drives, all stored in ROMS, no disk drives. 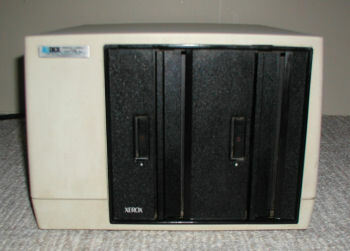 Little is known about the Discovery 500 Multiprocessor S-100 Computer by Action Computer Enterprise, Inc. I found ads for a similar system sold by the same company that appear in Byte magazines in 1981-1982, but no ads for the Discovery 500. 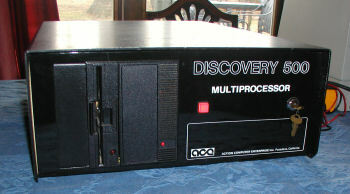 The Discovery 500 Multiprocessor S-100 Computer by Action Computer Enterprise, Inc. This is a "turnkey" system, note the key. 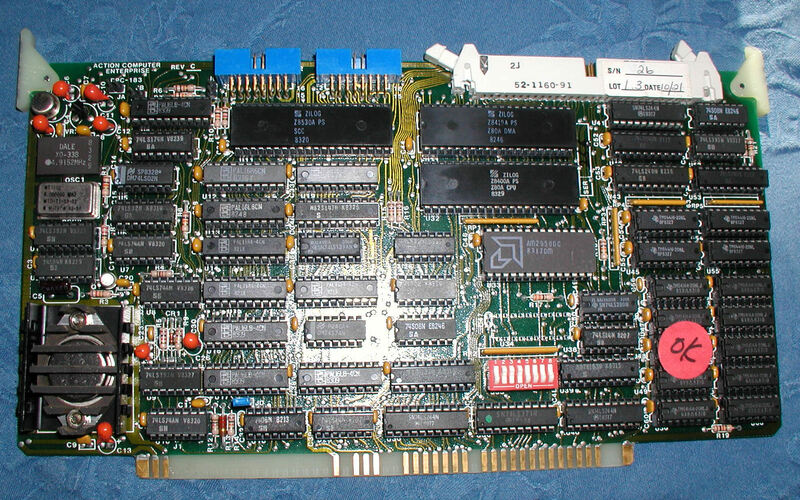 The multiprocessor calls the disk controller, but there is no functioning media. After checking for a disk in the floppy drive, the system searches the hard disk for an OS. The hard drive makes a horrible screeching, I doubt I will be able to get too far with it. 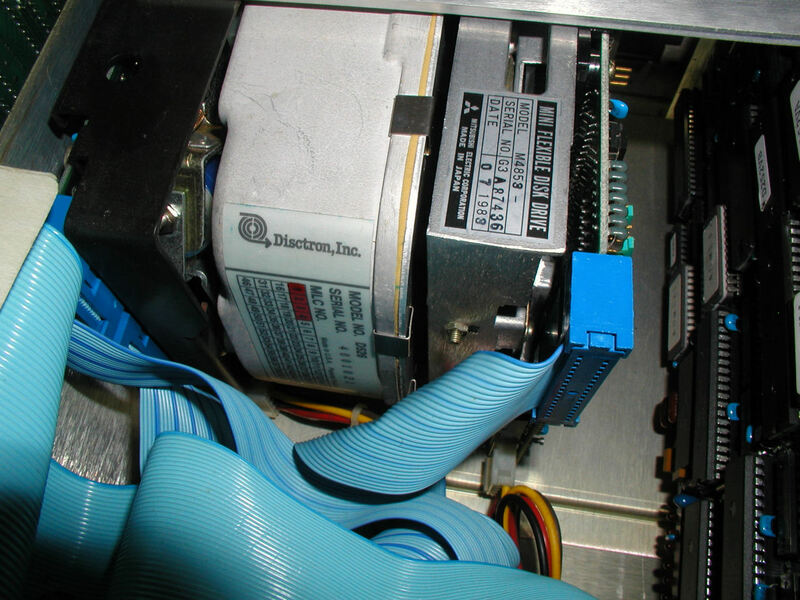 The hard drive is a Disctron, Inc model D526. The floppy drive is a Mitsubishi M4853. 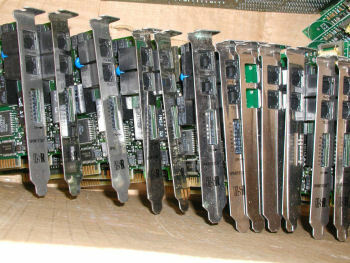 Photo of drives. 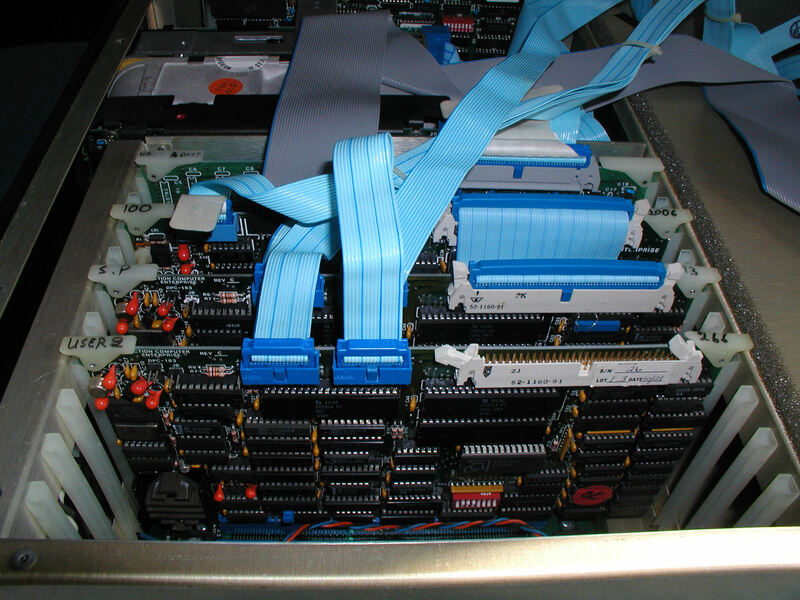 Although this is an S-100 system, the drive controller is not installed on the S-100 backplane and receives it's power separately. Instead the controller sits on the other side of the drives in it's own rails. The ACE Discovery 500 is a late S-100 era built for export to China as well as for sale in the USA. Based on the date stamp of the chips, I believe that the Discovery 500 was manufactured in 1983. 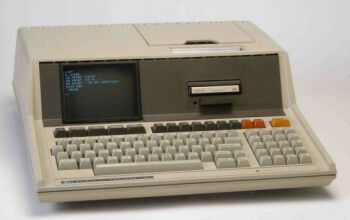 Action Computer Enterprise, Inc. was one of the pioneers in the development of early multi-user operating systems for business in the late 70's. I recently picked up the 2nd Gavilan laptop, the SC model. 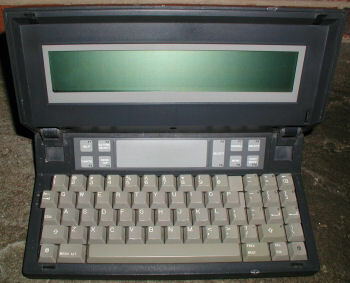 The 1984 DOS-based Gavilan SC laptop computer. There was so much battery acid leakage I was amazed I could even power up the system at all (after cleaning with a baking soda solution). When powered up, the system counts from 1 to 5 and then shows a code "010". Not much else. Does not attempt to boot the diskette that came with it. At least the LCD seems to be OK. 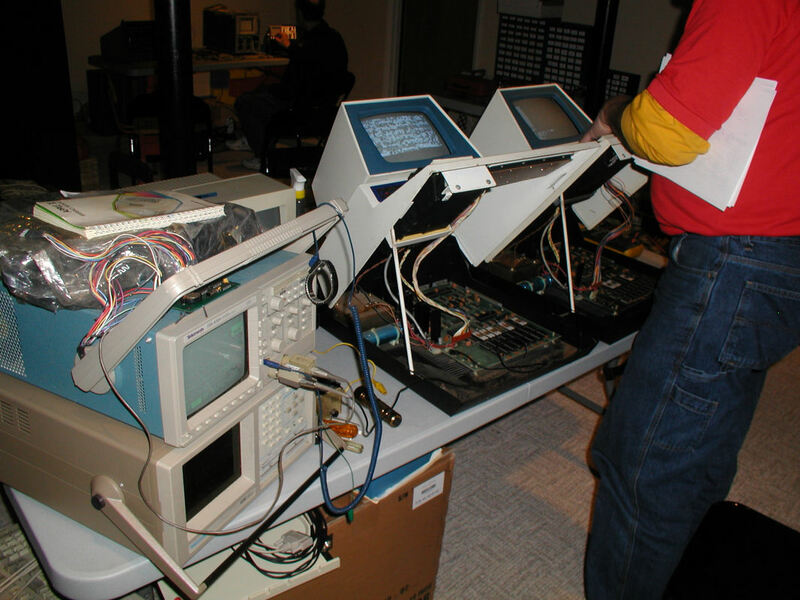 This weekend a few friends from the MidAtlantic Retro Computing Hobbyists came by to work on old systems. Here are a few pictures. 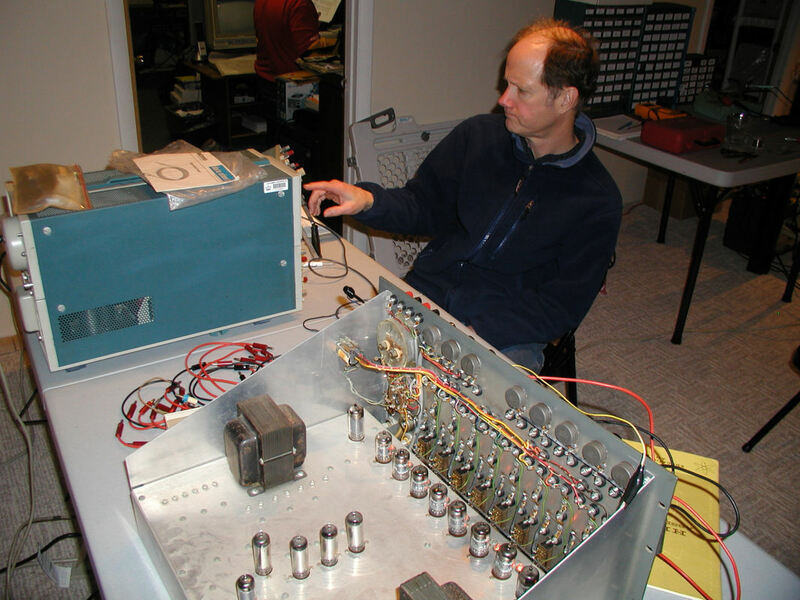 Bob Grieb adjusting my clunky oscilloscope in order to read the output from the Heathkit EC-1. Click image for larger picture. 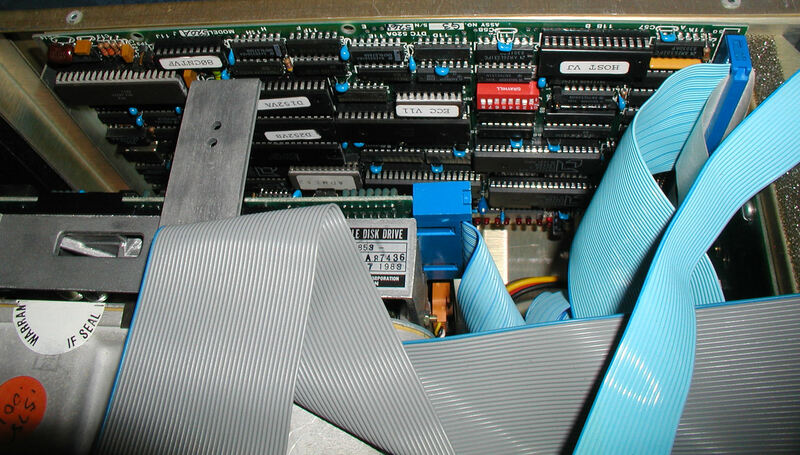 Dan Ragonti was able to almost get his PET 2001-8 working by swapping parts from a working PET for comparison purposes, and replacing RAM. The 1960 Heathkit EC-1 is one of the first desktop computers. 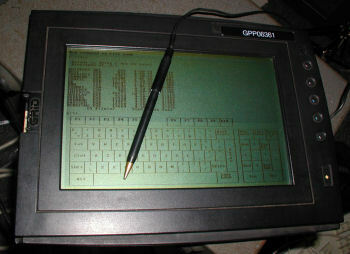 This is an analog computer with no RAM and whose display is an oscilloscope. 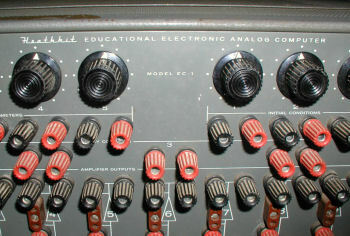 The Heathkit EC-1 wired for the "falling body" program. 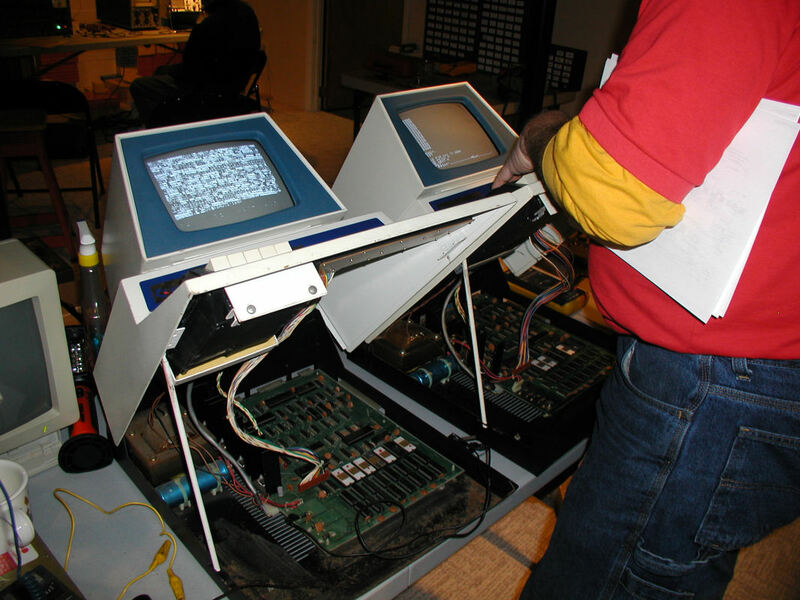 This weekend I worked with Bob Grieb, Dan Ragonti, and Mike Lowen to test the Heathkit EC-1 computer. We made it all of the way to the first exercise in the user guide - the falling body program. Quiz: what drives are in this Xerox x973 Dual 8" drive? 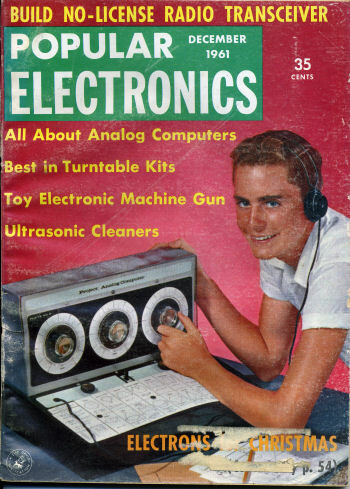 The cover of Popular Electronics December 1961, featuring analog computers. 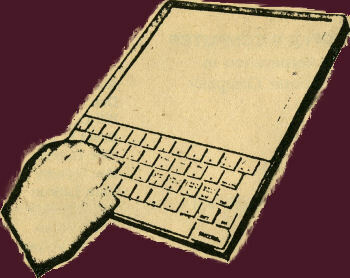 Artist's rendering of the XEROX Dynabook notebook computer. From the People's Computer Company May 1976 newsletter: "..We've been hearing about the Dynabook fantasy for a long time. Below are some excerpts from the recently published report on the Dynabook project, entitled "Personal Dynamic Media" by the Learnmg Research Group, Xerox Palo Alto Research Center. 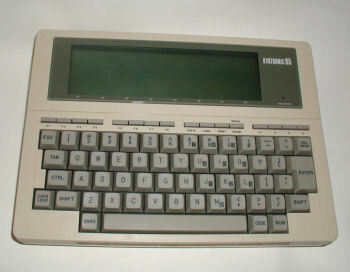 .."
The Kyotronic 85, also called the KC-85 and Kyrocera 85 (named for it's Intel 8085 processor) was an early laptop computer from 1983. In addition to contributions by Evan Koblentz and Erik Klein, some systems pictured in the recent MSNBC.com article about portable computer history contains images from vinatgecomputer.net. For your viewing pleasure, here is a short stock footage movie of actress Suzie Aster using an Epson PX-8 laptop computer. 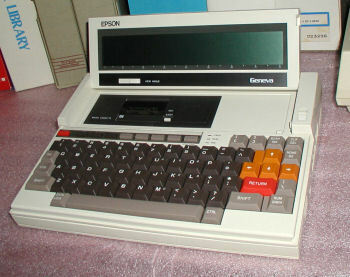 There were three PX-8 versions. The picture unit has the "Geneva" label, but there were also models with a PX-8 label, and a few without any label at all. 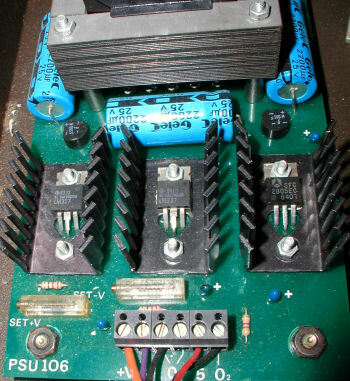 Closeup of the "LASER" PSU 106 used in the Malvern. This is not a stock CBM part.